Bake the cake in a 9x13 inch pan according to package directions. Stir a few spoonfuls of frosting into the crumbs, adding more as needed, until the mixture has the consistency of clay and can be shaped. Using a medium cookie scoop or spoon, shape the cake into 1 1/2” balls and set aside on a parchment lined sheet. Refrigerate for about 30 minutes to firm up. Melt the candy melts in the microwave according to package directions. We melted ours in the microwave at 50% power, stirring every 30 seconds. Be careful not to overheat the candy melts, melting them in smaller intervals as they become more liquid. Dip a stick into the melted coating and insert halfway into a cookie ball; repeat with all of them. Return them to the refrigerator for a bit to dry—but not more than 30 minutes, as the temperature needs to be close to room temperature for the coating to adhere well. Dip each cookie pop in the melted coating and tap very gently to remove excess. 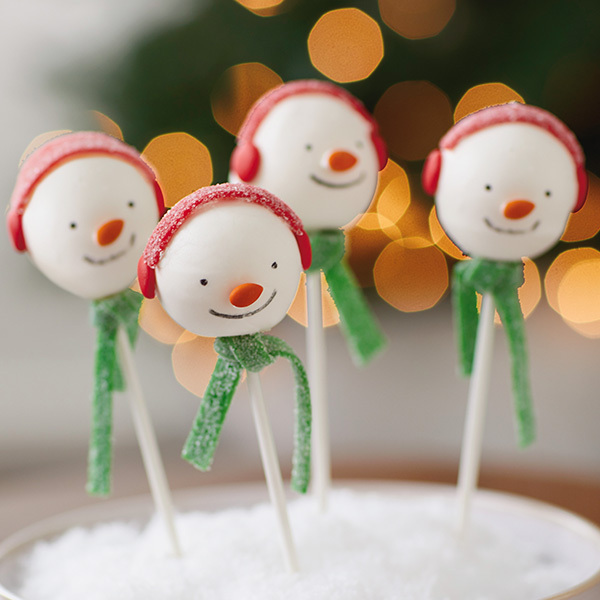 Place the stick upright in a foam block or cookie pop stand to dry. After the pops have set, it’s time to apply the face. First, make the eyes and mouth as shown with a food-safe marker. Use a small amount of liquid candy melt to stick on the chocolate-covered sunflower seed nose. Use more candy melt to apply candy buttons to each side of the head for earmuffs and a strip of sour candy over the top as a band between them. Finish by slicing the ends of a strip of sour candy to make fringe, tying it like a scarf, sliding it onto the stick, and pinching at the top to secure.